The day was September 21st, 2008 as the 0-2 Miami Dolphins arrived in Foxboro, Massachusetts. Miami was coming off of a 31-10 blowout loss in Arizona and entered Week 3 of the 2008 season having lost 20 of their last 21 football games. The New England Patriots were fresh off of a perfect regular season and had won seven straight AFC East titles. The Patriots had fallen short to the New York Giants in Super Bowl XLII the previous season, but arrived for that late September contest with a record of 2-0 and winners of 21 straight regular season games. Although the Patriots had lost quarterback Tom Brady for the season in Week 1, New England was still heavy favorites over the seemingly lowly Dolphins. Behind backup Matt Cassel, the Patriots had begun the season with victories over the Kansas City Chiefs and New York Jets with the defense allowing just 10 points in each. But while most thought that the Patriots would leave Gillette Stadium that day with a 3-0 record and a 22nd straight regular season win, New England had no idea what was in store for them. In a game that would change the direction of the season for the Miami Dolphins, the New England Patriots and the NFL was introduced Dolphins offensive coordinator Dan Henning's new offensive gimmick known affectionately as the "Wildcat". Much like the zone-read is run today, the Wildcat featured an option type scheme, but rather than having quarterback Chad Pennington take the snaps, the Dolphins' shotgun snaps went directly to running back Ronnie Brown. 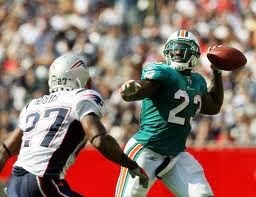 Brown took the snap usually with Miami's other talented running back, Ricky Williams, in motion. Sometimes Brown would keep the ball, sometimes he would hand it to Williams, but whatever he did that day, the Patriots had absolutely no answer for it. Brown rushed for three first half touchdowns to give the Dolphins what was an unthinkable 21-6 lead at the break. With just under six minutes to play in the third quarter and the score unchanged, Brown added a fourth touchdown, this time with his arm. Brown's 19-yard touchdown toss to Anthony Fasano gave the Dolphins a 28-6 lead. New England scored on its ensuing drive to cut the lead back to 15, but Brown put an exclamation on what was a stellar day on the first play of the fourth quarter. From the Wildcat formation, Brown took the first play of the final period 62 yards for his fourth rushing touchdown of the day and fifth total. Dan Carpenter would add a field goal later on for the Dolphins and Miami left Foxboro that day with a 38-13 thumping of rival New England. Brown finished the day with 113 yards rushing and four touchdowns on 17 carries while Williams added 98 yards on 16 carries. As a team, the Dolphins rushed for 216 yards while averaging six yards-per-carry. Chad Pennington, in what would be his first win as Miami's quarterback, also had a stellar day completing all but three his 20 attempts for 226 yards. For just the second time in 22 games the Miami Dolphins were winners, and for the first time in that same regular season span, the Patriots were losers. For the remainder of the season, Miami's Wildcat helped keep opposing defenses off balance as the Dolphins reeled off 11 wins over their final 14 games to finish 11-5 and complete the NFL's best single-season turnaround after just a 1-15 campaign in 2007. Miami captured the division title that season, their first in eight years. The division title also meant that the Dolphins were playoff bound for the first time in seven seasons. The Patriots went on to finish 2008 with an 11-5 record as well, but missed out on the playoffs and an eighth straight AFC East championship thanks to that September afternoon in Foxboro. Fortunes have certainly been different for the franchises since as New England has claimed each of the last four division crowns while Miami has had four straight losing seasons. But September 21st, 2008 was a day that stemmed the tide for the Miami Dolphins and it remains one of the team's best victories in recent memory.